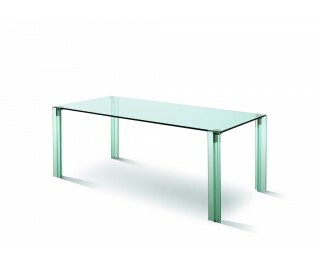 Table with tempered crystal glass top (thickness mm 15) and crystal legs, thickness mm 19, available in float transparent or extra-clear crystal. Legs are provided with a special metal joint that helps the simpler assembly of the table. Two trestles are furnished to allow the customer an easier assembly with no need to apply for skill labour.